You guys, this home is so unbelievably amazing (and huge) and the photos so beautiful, I’m going to be spreading the tour out over the entire week! (The very week I’m scheduled for jury duty…we’ll see what happens!) The daydream starts today, all thanks to Titan Constructors, Four Chairs Furniture and Hiya Papaya Photography! 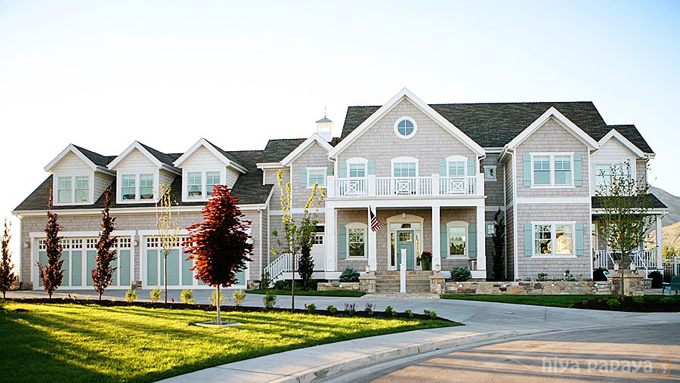 This incredible home is located in Highland, Utah and was one of the stops on this year’s Utah Valley Parade of Homes. Can you imagine stepping inside and entering the jaw-dropping great room?! I can’t tell you how much I love the mix and match of fabrics in that space…interior designer Lindy Allen of Four Chairs Furniture has such a way with color and pattern, I seriously love everything she does! The craft room has to be the coolest one I’ve seen too. What a fun use of wallpaper! Love the collection of colorful furniture pieces too! I’ll share the paint colors at the bottom, but if you spy something else you love, definitely check out Four Chairs Furniture or contact Lindy for more info! And thanks once again to Hiya Papaya for the gorgeous photos! P.S. The only other week-long home tour I’ve done was another project designed by Lindy Allen and photographed by Hiya Papaya–the beloved Dream Home Tour of 2011 as seen below. Pretty sure it’s my favorite home of all time. And get this….the home is currently for sale!! Take a look at the listing here, if only to take it all in again! Love this house! Can't wait to see the rest of it – my week just got a whole lot better!! What a stunner! Can't wait to see the rest. I think this is a wonderful example of excess and greed. So much waste. I WOULD CRAFT SO MUCH IF THAT WAS MY CRAFT ROOM! Do you see those colors?! GAH! The shapes and tones and hues and patterns. I'm just swooning. Lexie – judgmental and jealous, much? that price for that much square footage?! i live in the wrong state. can someone tell me the name of the floor!??? i love it!!! Where did you buy that pillow cover? Its the greenish-bluish one. Do you know the height the orb lights were installed’ from the ceiling? It looks like 2 of them are 3 feet and one at 4 feet or more? I’m installing very similar experience lights and have an almost identical 2nd story open landing, overlooking the lighting and first floor.